The Meath Senior Cross Country was staged in Dunboyne on Sunday 9th December. The 8km course at the Cowpark held up very well and the weather was as good as could be expected at this stage of the year. 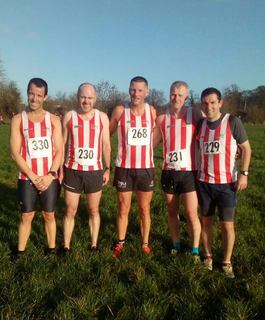 Our senior mens team of Ernest Asensio Blasco, Mark McGee, Sean Murphy, Enda Markey and Pauric Farrell put in a great team effort to finish as the third placed team. What a great achievement by a squad which included four of the lads who won team silver in the county masters race last weekend.